Kiyomizu-dera (清水寺) is Kyoto’s most famous temple. Almost every traveler who passes through Kyoto would have made a trip to see this UNESCO World Heritage Site, built on the hillside of Higashiyama. 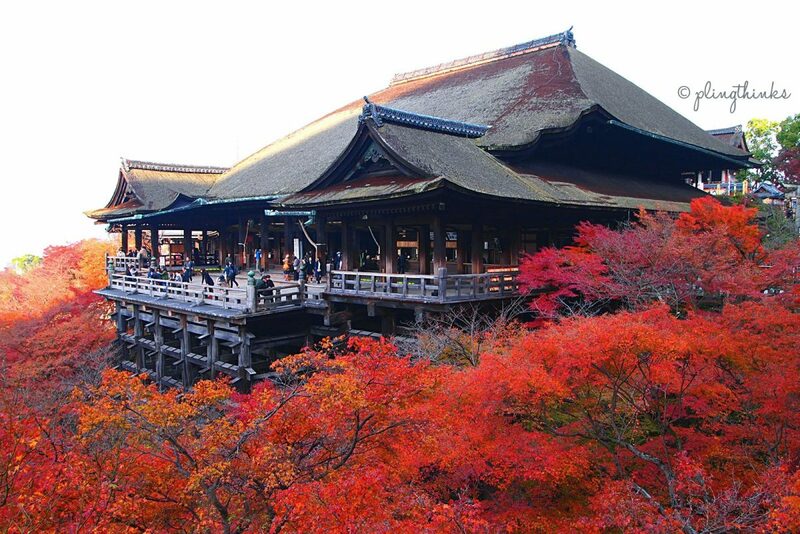 And if an airline or a travel agency would have to pick a representative picture of Kyoto, we bet a photo of Kiyomizu-dera in its autumn splendor would have been one of the top 3 choices, if not the first. For friends travelling to Kyoto with us for the first time, we’ll definitely put Kiyomizu-dera on the itinerary. This meant that we have visited Kiyomizu-dera 3 times! Don’t we tire of it? Not at all. The charm of Kiyomizu-dera extends beyond the temple itself to the Higashiyama district 東山区, a meandering historical area that seeks to be explored again and again. It’s also about an hour’s walk to the Gion district. An uphill trek through the steep Kiyomizu-michi 清水道, or Chawan-zaka 茶碗坂 (Teapot Lane) preludes a visit to Kiyomizu-dera. Shops selling souvenirs, Kyoto snacks, street food, and handicrafts line Chawan-zaka, marking it as a popular spot for getting gifts or omiyage お土産 back home. With many accolades packed under its belt, we picked out 8 things to do at Kiyomizu-dera. At the bright 2-story entrance gate Rōmon 楼門 of Kiyomizu-dera, where the 3-story pagoda Sanjūnotō 三重塔 is, there’s a perfect spot to take in the expanse of Kyoto city with the Kyoto Tower in plain sight. Founded in 778 A.D., the present structures were rebuilt in the 17th-century. If you are blessed with clear skies, and the light is in your favor, you can even get a shot of the temple and the surrounding treetops against the city skyline. Having been to Kiyomizu-dera 3 times – end of spring, beginning of autumn and peak autumn, we were blessed to take in the beauty of the temple grounds set against backdrops of lush green (spring), variegated yellows (early autumn) and brilliant reds (peak autumn). The next time? We’ll get to Kiyomizu-dera during the peak spring season when cherry blossoms reign on this particular hillside. There are also nighttime illuminations in mid-March (cherry blossom season) and late November (peak autumn colors), which you can check out. Japanese craftsmen are amazingly precise! Building a stage without nails, stacking wood upon wood, and doing this on the steep incline of a hill, go beyond what our puny minds can fathom. This Hondō 本堂 or main hall perches atop the hillside, and you can marvel at the ingenuity of their craftsmanship from the side, or at the base of the temple. And while you’re standing in the main hall, cast your eyes across the treetops to the far southern end of the temple grounds to see the three-story Koyasu Pagoda 子安塔. Visitors can take a sip of mountain spring water from Otowa Waterfall 音羽の滝 using the long scoops provided at the site. Hold out the long scoops, which has been pre-sterilized in UV blue light, to catch one of the 3 streams of spring water. Each stream is said to bestow longevity, success, and love. Go early, as the queues for Otowa Waterfall can get windingly long. Just a short walk from the main hall of Kiyomizu-dera is a smaller shrine, Jishu-jinja 地主神社, where students and young persons flock to. Dedicated to the deity of love and matchmaking, it’s one place frequented by those looking for love – some shyly, some boldly. You might chance upon people walking, with their eyes closed, between the 2 stones placed 18m apart at the shrine’s entrance. Some believe that this will bring their luck in finding their true love. In the back gardens of Kiyomizu-dera, where few wander through, are little stone statues called Jizos 地蔵, placed in no obvious patterns throughout the paths leading out of the temple. When we visited, they donned little aprons or hand-knitted hats, giving off an eerily mysterious atmosphere. Little did we know the sad stories behind these seemingly peculiar statues. Upon research, it seems that these little aprons are not aprons at all, but bibs. These bibs mimic the ones worn long ago by children, and parents dress the Jizos to ask for protection over the souls of unborn or lost children. There are a few temple rest huts situated at intervals in the temple. We always took a rest at these huts, drinking tea, and eating matcha dangos or zenzai, as we admired the surrounding magnificence. Matcha dangos are one of my favorite Japanese snacks to buy home. We love their chewiness and the slight bittersweet matcha flavor. They can be purchased at some of the shops along Chawan-zaka and in Kyoto Station. Having them here, coupled with a cup of smoky tea, and midst such tranquil beauty is a different experience and definitely one enjoyment we revel in. Walking towards the exit, there’s a beautiful place to take a parting shot of the three-story Pagoda framed by lush leaves and against clear blue skies. If you attempt a low-angle bottom-up shot, you can get a group shot of these with your traveling party. pling thinks…you may like to get to Kiyomizu-dera in the early hours to avoid the huge crowds, which make photo-taking difficult and the queue to the Otowa Waterfall long. After a visit to the temple, one can then leisurely explore Chawan-zaka, the Higashiyama, and Gion districts, or head to Hisago for a flavorful bowl of oyako-don. A very comprehensive guide is available in English, Mandarin, Korean and Japanese. Alight at Gojozaka stop 五条坂. Cross the road and start the trek uphill along Gojozaka 五条坂 and onto Chawan-zaka 茶碗坂 towards Kiyomizu-dera. of it I have you bookmarked to take a look at new stuff you post.